Now available with GPS module capability to auto set time & date and 1PPS timebase. 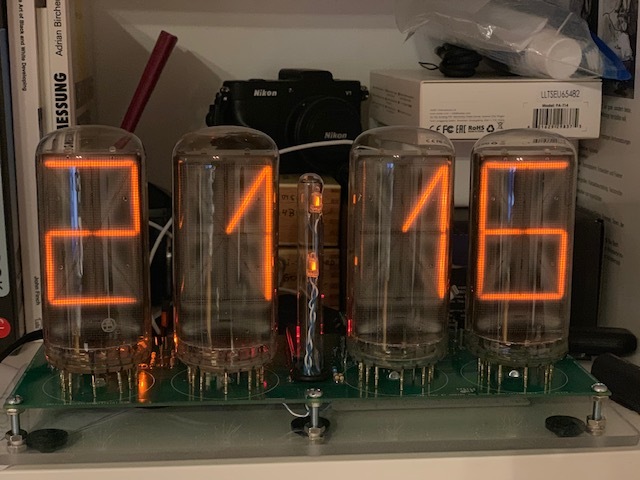 Click here for the nixie clock kit for IN-12A/B nixie tubes including the six tubes ! The kit I have available is two professionally made pc boards and the components to populate them, including the ICs and the preprogrammed microcontroller written with my firmware. The boards can be stacked as in the builds shown on the Home page. 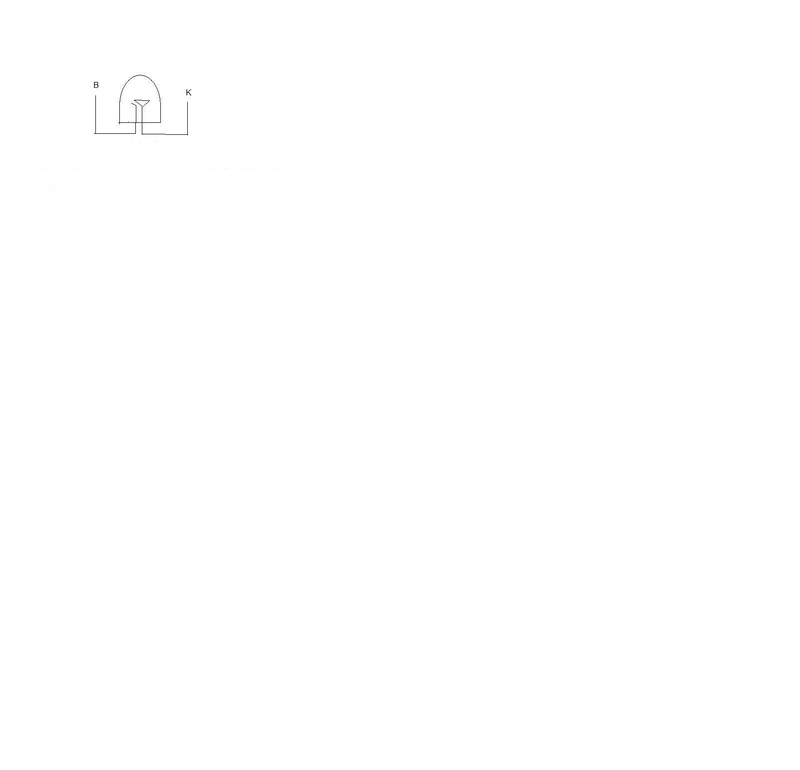 I supply the instructions for assembly and a parts list with the board and components. Works really well with IN-8-2 Nixies. Also works with IN-14, ZM570 and other similar nixies with same pinouts. Email me at: Howchon@hotmail.com for docs. Click the links below to open the files individually. Price = $155 + shipping. The RGB leds are new, an option that allows selected color changes of the underlighting leds. Below is a link to Sphere Research, they have many types of Nixie tubes and other vintage electronics for sale. Also now offered in optional forms of just the PC boards & chips (experienced builders can use the parts list & instructions to assemble) or the full kit with the homemade enclosure (nixies not included). The board connects to U.S.(120VAC) or other (240VAC), and it works really well with the IN-8-2 Nixies. 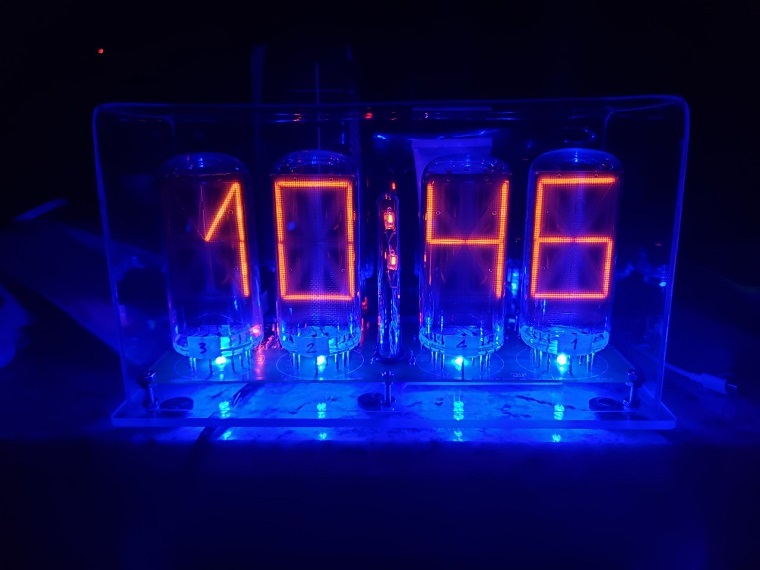 It also works with IN-14, ZM570 and other similar Nixie tubes. Please send me an email if you want to inspect the details and I will email you back with the zip file attached. Click here to visit Sphere Research to find Nixies and other vintage electronics for sale. 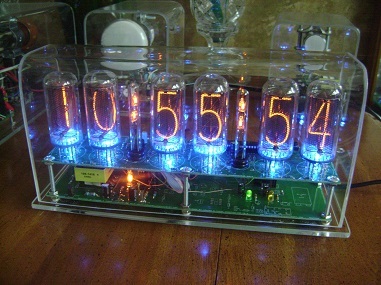 Nixie clock kit for IN-12A/B nixie tubes including six IN-12A/B nixie tubes ! The complete kit ($185) includes two professionally made pc boards and the components to populate them, including the ICs and the preprogrammed microcontroller written with my firmware and six IN-12A/B nixie tubes and a homemade enclosure as shown ! 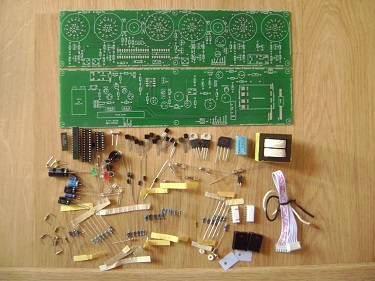 I supply the instructions for assembly and a parts list with the board and components. 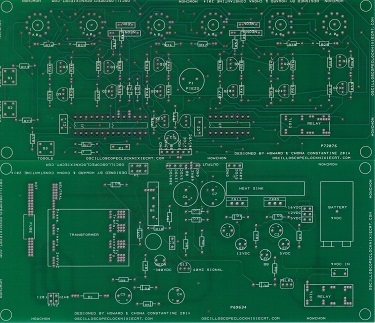 Click the links below to open the files individually.There are several other options: the pc boards & chips (microcontroller & decoder) only for $52 + shipping, the full kit with boards, components & chips for $125 or the full kit including nixies for $155. The board connects to U.S.(120VAC) or other (240VAC), and it works really well with the IN-12A/B Nixies. Please send me an email if you want to inspect the details and I will email you back with the zip file attached. An example of the kit built with a single thermoformed plexiglass enclosure. The kit I have available is two professionally made pc boards and the components to populate them, including the ICs and the preprogrammed microcontroller written with my firmware. The boards can be stacked as in the builds shown on the Home page. 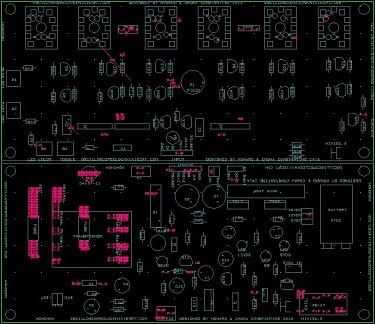 I supply the instructions for assembly and a parts list with the board and components. Works with IN-18 Nixies. Email me at: Howchon@hotmail.com for docs. 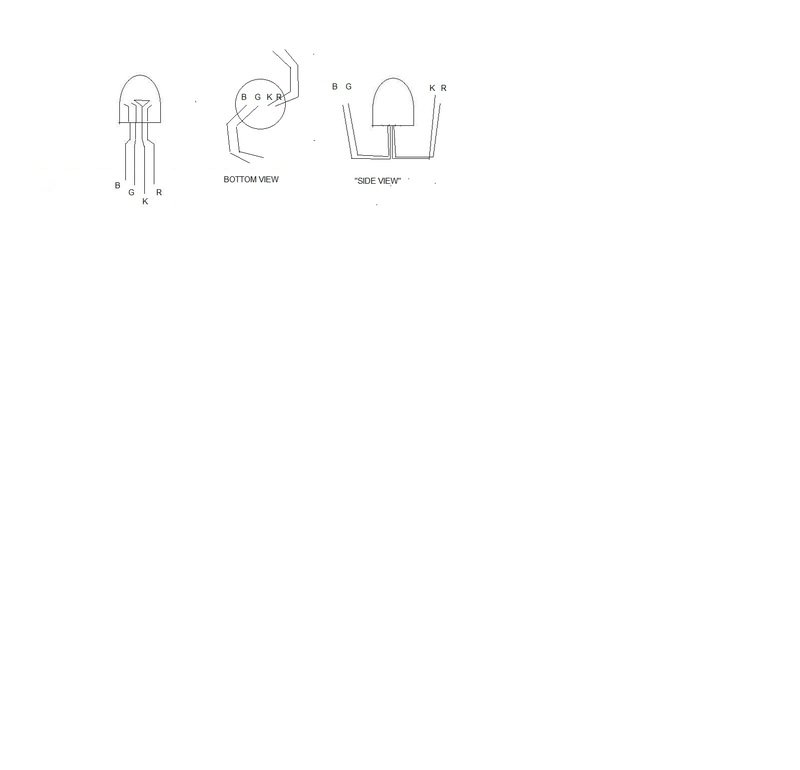 Click the links below to open the files individually. Price = $165 + shipping. The RGB leds are an option that allows selected color changes of the underlighting leds. Also offered in optional forms of just the PC boards & chips (experienced builders can use the parts list & instructions to assemble) or the full kit with the homemade enclosure (nixies not included). 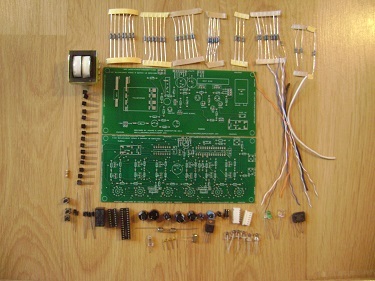 The board connects to U.S.(120VAC) or other (240VAC), and it works with the IN-18 Nixie tubes. 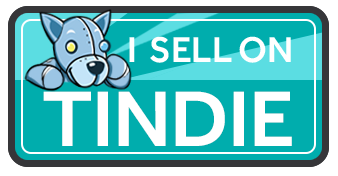 Please send me an email if you want to inspect the details and I will email you back with the zip file attached. Below are some of the clocks built using the kits! 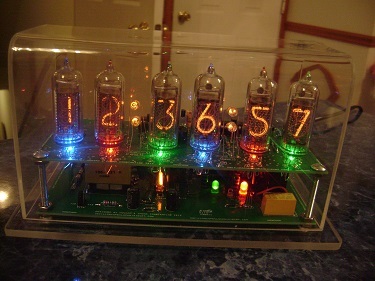 The clock above was built using the first kit with IN-8-2 nixies. The builder used the same homemade type enclosure. A build using the original kit from several years ago, also using the IN-8-2 nixies. 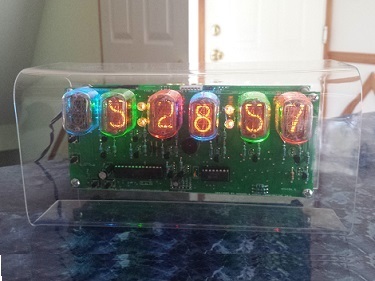 A clock built using the Nixie7 full kit for B7971 nixie tubes. 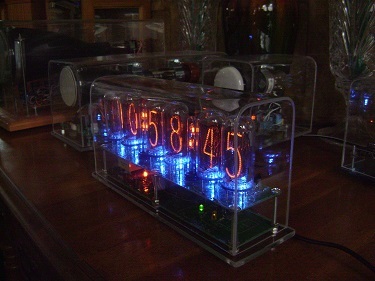 Another B7971 clock built from the full kit assembled in the enclosure.